The client is set to Auto Config and the server to configure interactively. Client machines should not have an option to use either Auto-Config or Configure Interactively. 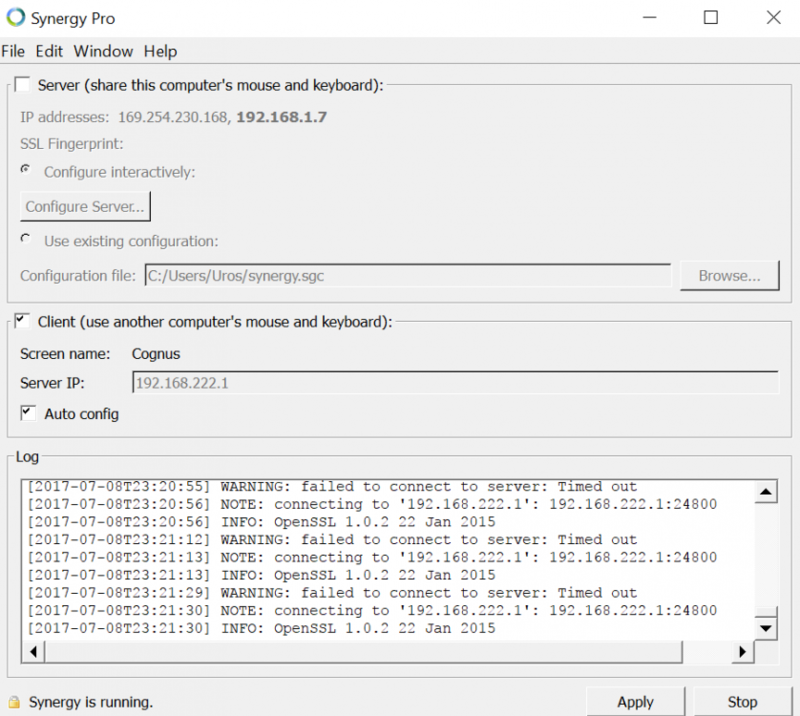 Please post a screenshot of both machine's Synergy interface and the Server Configuration interface on your server machine for us to further check on this issue. Hi @Kuki. It seems that you haven't been able to add the client's screen name on your server configuration interface yet. Please refer to Getting started with Synergy knowledge base article for steps on how to do an initial configuration. Thank you @Paul Suarez, but after configuring everything exactly like the guide the client is still showing the same text, i.e. the connection is timing out. Below is what the server configuration looks like. Just tried reversing the roles, works perfectly fine, I have no idea what's happening. Tried entering other listed ip addresses and/or changing the port on both machines, nothing helped. If it's of note, the client is a laptop and server is a desktop computer. For some reason, the connection was successful when I turned off SSL encryption on both machines. And to a surprise, when i turned it back on it worked. I also had to use an alternative server IP address. That's great @Kuki. Thanks for the update too.